Every February, Americans celebrate the presidencies of George Washington and Abraham Lincoln on the third Monday of the month. Presidents' Day is often nothing more than a day off for children in school, and a prime sale weekend for Americans to engage in their favorite sport of shopping. 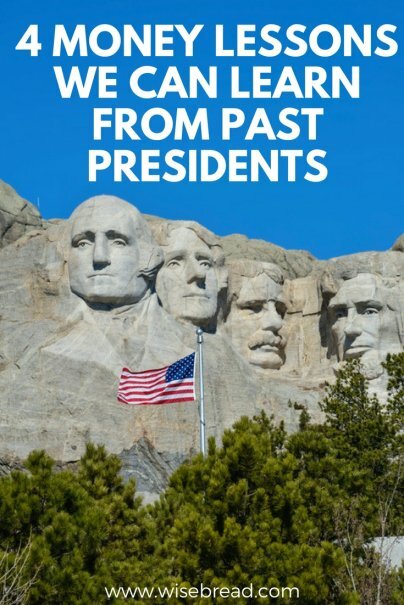 But rather than spending money on Presidents' Day, why not learn some of the most important money lessons from the lives of former presidents instead? Here are four vital money lessons that past presidents can teach us. Our first president was both a canny strategist in war, and a very smart investor. In 18th century Virginia, tobacco farming was an extremely profitable business, and George Washington grew the crop on his farmland. Tobacco growers made a great deal of money by shipping their product back to Europe. However, in 1766, Washington decided to stop growing tobacco on his land, because the crop was hard on the soil and was becoming less profitable. Instead, he planted several different crops, including wheat, corn, flax, and hemp — all of which had a local demand and did not require shipping overseas. This was a very smart move, as it both diversified Washington's crop production, and ensured that he was not vulnerable to loss during the transportation process. Other Virginia farmers who continued to grow tobacco (including Thomas Jefferson) lost their shirts. Thomas Jefferson is one of our country's most beloved founding fathers. The red-haired intellectual was responsible for writing the Declaration of Independence and went on to become the third U.S. president. But despite his overwhelming political success, Jefferson's last years were plagued by financial difficulties, and he died completely broke. What's even more surprising about Jefferson's money trouble is the fact that he obsessively tracked his spending throughout his life. According to the overseer at Monticello, Jefferson's estate, "Mr. Jefferson was very particular in the transaction of all his business. He kept an account of everything. Nothing was too small for him to keep an account of it." Unfortunately, the daily tracking of Jefferson's finances did not keep him from spending well beyond his means. Jefferson had very fine tastes, and would spend lavishly on wine, furnishings, and updates to his estate at Monticello. Though he dutifully recorded all of his over-the-top purchases (not to mention each and every small purchase), it did not stop him from spending more than he could possibly afford. Abraham Lincoln's impoverished childhood in a log cabin not only adds to the heroic patina of his life's story, but it also helps to explain our 16th president's lifelong frugality. In fact, Lincoln saved much of the $25,000 annual salary he made as president. According to author Harry E. Pratt, "[Lincoln's] estate grew from $15,000 in 1861 to more than $85,000 at his death. The increment came principally from his $25,000 yearly salary as president." Lincoln was also frugal with public money, becoming angry when his wife, Mary Todd Lincoln, blew her budget by almost $7,000 while refurbishing the White House — after Congress had already allotted $20,000 for her to use. He recognized that it was unseemly for Mrs. Lincoln to spend $20,000, much less $27,000, on furnishings and upgrades when Union soldiers were going without blankets. Beloved Civil War hero (and the impressively bearded face on our $50 bill), Ulysses S. Grant was a talented Army general and a well-liked president. However, he struggled with money in his personal life from beginning to end. In particular, after the end of his presidency, he decided to settle in New York and try to make a fortune in banking. He partnered with 33-year-old Ferdinand Ward, who at the time was known as the "Young Napoleon of Wall Street," to create the investment firm of Grant and Ward. Unfortunately, Grant's lack of financial savvy was his downfall. Ferdinand Ward was nothing but a swindler, and Grant and Ward was simply a Ponzi scheme that Ward set up to bilk money out of Grant's famous and rich friends. When the entire scheme blew up, Grant had been diagnosed with cancer and knew he had only a short time to live. The former president was only able to avoid leaving his wife destitute by writing his memoirs and having his friend Mark Twain publish them. The book became a best-seller, but Grant did not live to see it.